Kenton's Infotainment Scan: A tale of two covers: to whom does Toronto stink most? A tale of two covers: to whom does Toronto stink most? The cover in the rest of Canada. Something smells in the Big Smoke. In its last issue, Macleans magazine figured it would tell Torontonians something that the rest of Canada has been saying for years: Toronto stinks! 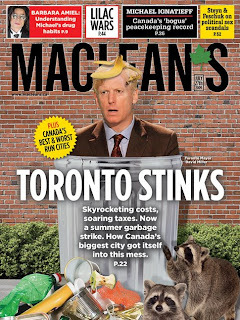 To rub salt in the wound, Macleans put the words in boldface type atop a crudely Photoshopped Toronto mayor David Miller in a trashcan with a banana peel on his head, raccoons and garbage in the foreground. 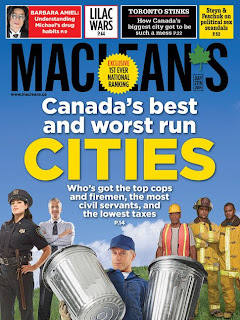 But in the rest of its Canadian print run, Macleans buried the lede, making the story the totally boring "Canada's best and worst run cities." Yeah, yeah, fine, fine, but what was that about Toronto stinking again? Oh, yeah, there it is in tiny reverse type above the masthead. Clearly Macleans thought that the Torontocentric story wouldn't have resonance in the rest of Canada. But, on behalf of the rest of Canada, I'd like to say: Macleans, never underestimate the schadenfreude for Toronto outside of Toronto. Keep your two covers, I say, just send them to the opposite audiences. When I hosted at Rumor's Comedy Club in Winnipeg, it was common for headliners from Toronto to say to me, "Don't say I'm a Toronto comic when you introduce me, OK?" I once saw Derek Edwards, my favorite Canadian comic, stop his show when it wasn't going well and say, "Who wants to take a dump on the Big Smoke?" Cue cheers. Speaking of schadenfreude, the Globe and Mail was back to its old tricks today; this, remember, is the newspaper that constantly rips apart Winnipeg any chance it gets and once even suggested that our city should just close up shop. Of course, today's article about Toronto is headlined "Schadenfreude does not apply" and makes the case that "despite signs of decay, the city that Canadians love to hate still has a shining future." In other words: there's some gleaming chrome 'neath the garbage. "Canada has only one really global city. In spite of the parochialism of its politicians, and woe-is-me-ism of its overtaxed, underserviced citizens, it is only Toronto that gets flagged by leading thinkers as being a contender on this score. If it plays its cards right, its best is yet to come." Take it to the curb, girlfriend. Canada only has one global city? What about Montreal...or Vancouver...or Winnipeg? If you use the characteristics outlined in the Wikipedia entry of "global city" (http://en.wikipedia.org/wiki/Global_city), Toronto would definitely make the cut. However, you could also make a very strong argument for Montreal and Vancouver as global cities. Cities such as Winnipeg, Calgary, and Edmonton, while having some characteristics of global cities, sadly wouldn't make it. Personally, I would say that Toronto is a global city and Montreal is also (especially as Canada's hub of French history and culture). Vancouver I would call an emerging global city. The 2010 Winter Olympics could be just the thing to showcase Vancouver's credentials to the world and vault it into the ranks of the recognized global cities.